Wild Wolf is one of the most iconic slots around in this day and age. 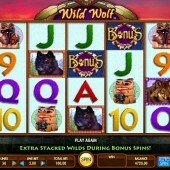 If you enjoy playing slots, particularly ones developed by IGT, then you will no doubt have heard of Wild Wolf. It is a 5 reel, 50 payline slot game that has a theme based on wolves and is the one slot that IGT slots released ever since all try to surpass. It has long been a land-based favourite and its transition to online play has exceeded all expectation. The game is full of wolf related imagery and the symbols included in the game are all based on different types of wolf. There is the Black Wild Wolf, Brown Wild Wolf, Wolf Spirit Statue and Wolf Statue acting as regular symbols during the game. In Wild Wolf the Wolf is Wild! Wild Wolf is packed with symbols that include wolves in all shapes and sizes. The Wild symbol is represented by a wolf howling against the backdrop of a full moon. The Wild symbol substitutes for all other symbols except for the scatter symbol to complete winning combinations. It is possible for you to hit up to four of these Wild symbols on a single reel turning it into a stacked Wild. The Scatter symbol is represented by the Bonus symbol against a dreamcatcher model and even the letter ‘o’ in the word ‘Bonus’ is replaced by a wolf paw print. The scatter symbol is also key to triggering the game’s main bonus feature. 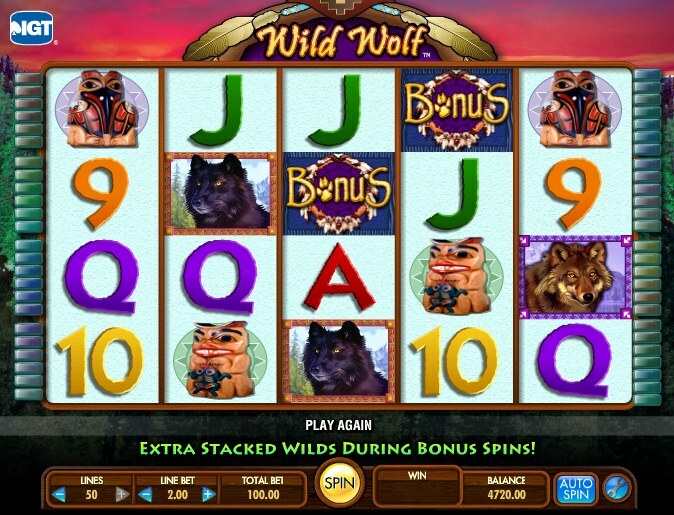 This slot comes with one main bonus feature called the Wild Wolf Free Spins Bonus. It is triggered when you hit three or more of the Bonus Scatter symbols across reels 2, 3 and 4 during regular game play. It is worth noting that during the Wild Wolf Free Spins Bonus there are more Scatter and stacked Wild symbols included on the reels giving you an increased chance of winning prizes during the bonus feature. You will begin this bonus feature with 5 free spins initially. There is the chance to re-trigger the 5 free spins by hitting the Bonus scatter symbols on reels 2, 3 and 4 during the free spins with the opportunity to win up to 255 free spins. Wild Wolf is an institution in itself. Playing this game is sort of like a rite of passage for slots players the world over. It is the old faithful that you can always rely on to give you an enjoyable game. Other IGT developed slots such as the snowy tundra themed Siberian Storm and the owl themed Super Hoot Loot have all tried to replicate the amazing lure of Wild Wolf’s animal theme and despite being solid slots in their own right, they just aren’t Wild Wolf.